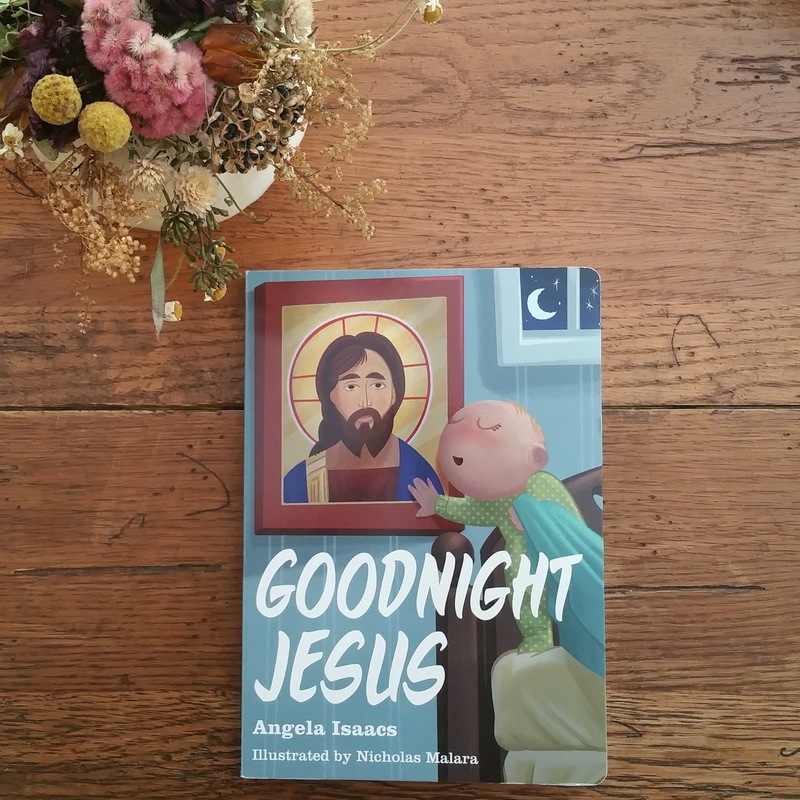 We recently received a copy of one of the latest books offered by Ancient Faith Publishing, Goodnight Jesus. It is a beautifully and colorfully illustrated board book for babies and toddlers and is perfect for bringing to church services and reading at home. I love that it was printed as a board book! All three of our children loved being read to and we often chose board book versions of our favorite stories to ensure durability while in the hands (and mouths!) of the babies. Kissing is one of the first things that a little one learns to do, and this nicely-sized board book is a good springboard for introducing the idea of kissing icons. Goodnight Jesus is full of illustrations of Christ and the Mother of God, well-known saints of the Orthodox Church, and family members a baby would be familiar with. The language is simple, yet lyrical and will capture the attention of busy toddlers. I am very glad that Ancient Faith Publishers has put out another board book for the little people that we know and love. It is a lovely companion for Josiah and Julia Go To Church, a family favorite! Note: One thing that I did want to mention is the fact that the author chose to address the Savior as only "Jesus" without any title such as The Lord or Christ. In addition, the word 'Saint' is not used before the names of the Saints illustrated within this book. While this is common for many Protestant Christians, it may seem irreverent to some Orthodox Christians who might find this overly casual. This looks so cute. Interesting point in your last paragraph, too! I occasionally refer to my very best Saint friends by their first names, but even then, not too often. It does seem odd not to just say St. James or whatever. I can see referring to Our Lord as simply "Jesus" to young children; I think we do with our littlest in our family, although as they get older, I encourage more reverent titles, unless it is in direct historical context. I just reviewed this board book too - loved it, and your review. I hope Orthodox Christians won't interpret this book as too casual or irreverent. I think the Bible story format - the omission of "Saint" before the apostles' names, along with the casual style of the iconographic illustrations - was a conscious effort by the author and illustrator to present a children's book that could help any Christian child understand why we Orthodox do all this kissing. :) Ordinary men and women and objects like a Gospel book and a cross have been made new in Christ. 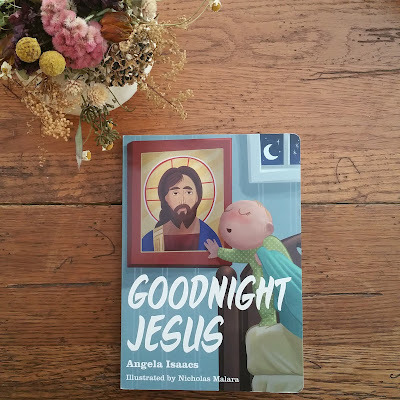 Mainly though, I think the author's intent was to present to children Christ and the saints as familiar and loved members of our family, who we always kiss goodnight. I wanted to thank you for the lovely review of my book. I'm so glad you like it! Second, I wanted to weigh in on the question of using informal addresses for Jesus Christ and the saints. I did not intend to be irreverent and I humbly pray for your forgiveness for any wrongdoing. As WendyLady said, my hope was to encourage children to love Jesus and His saints. I was inspired to write the book while watching my own young daughter kissing icons. I realized that the simple act of kissing an icon was a powerful message about our beliefs. We love Jesus and His saints. Children, even young ones, understand love. My hope was that through this book, children would come to know these people and love them. Also, I wanted to create something that would be appealing and understandable to young children. That meant using simple language and descriptions that children could identify. (Like St. John the Baptist's scratchy clothes.) I can't speak for Nicholas Malara but I know he voiced similar ideas. He wanted to make something appealing to children (through bright colors and simple style). He also wanted to be respectful and reverent to the underlying theology of iconography. It's not an easy balance and I beg your forgiveness for any ways in which we stumbled. Thanks for the clarification, Angie! Your book is really very lovely and I'm happy to have it as part of our home library! Hi Emma! I was wondering if I could use this lovely photo in a blog post about my book. I tried emailing you but the email address in your profile doesn't seem to work.